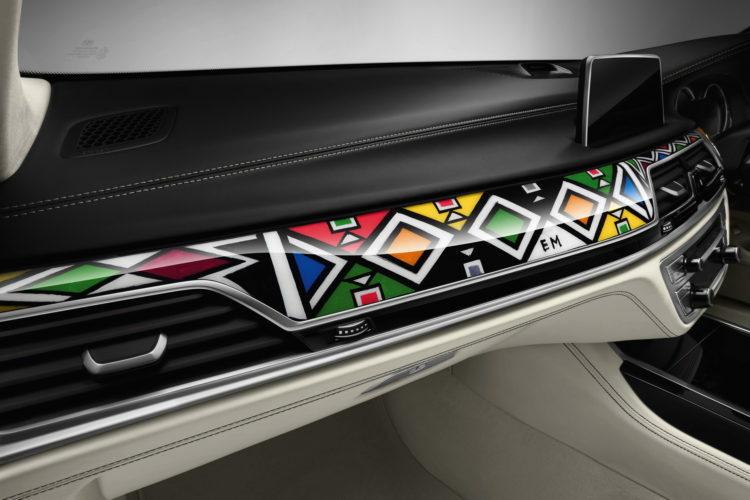 25 years ago, Esther Mahlangu, a South African artist, was the first woman to create artwork on a BMW 525i Sedan. Its bodywork was adorned with the bright colors and unique ornamental shapes, typical of Ndebele art, thus turning it into a BMW Art Car. Esther Mahlangu has now, for the second time, joined forces with BMW and refined a BMW 7 Series. 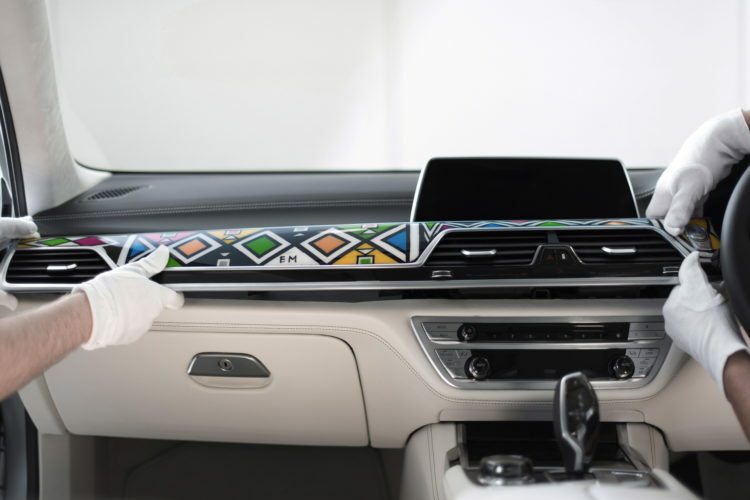 In collaboration with the BMW Individual Manufaktur, Mahlangu transformed a luxury sedan into a dynamic work of art by painting her characteristic motifs on the real wood interior trims. 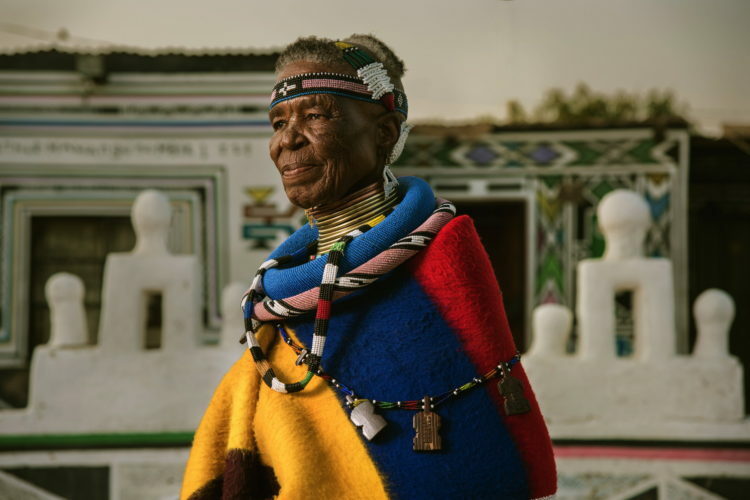 Esther Mahlangu was born a member of the Ndebele tribe in 1935 in Middelburg, a small town in the north-eastern province of Mpumalanga. At the early age of 10, she began to paint under the guidance of her mother and grandmother. Traditionally, Ndebele women decorate the exterior walls of houses with elaborately painted patterns and graphic elements, symbolising important events such as weddings or other celebrations, thus the walls are used as active communicative media within the community. 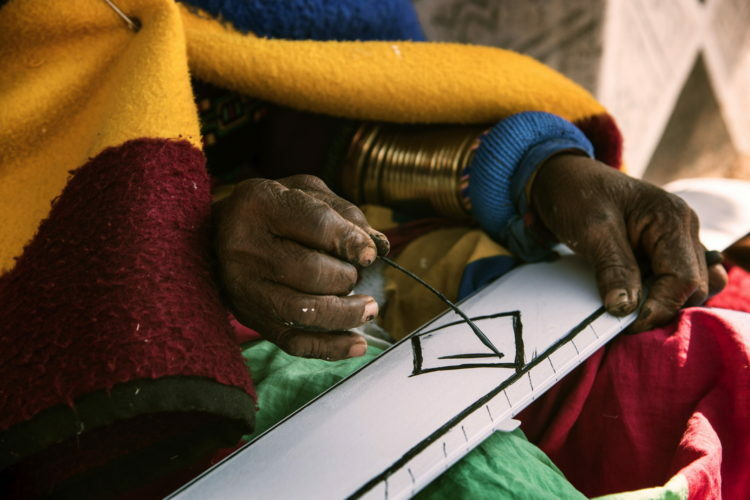 Esther Mahlangu has separated these decorations and patterns from her people‘s traditional art of painting. In the form of pictures, vessels or carpets, she has constantly brought it into new contexts, thereby combining her artwork with items used in everyday life. To facilitate this the specialists at BMW Individual Manufaktur oversaw the full manufacturing process. They developed a special white-colored fine-wood trim to be painted with Esther’s images before sealing them to ensure their longevity and installing them within the equally remarkable vehicle. The one-of-a-kind automobile will be shown to the public for the first time at this year’s Frieze Art Fair (5- 9 October) in Regent’s Park, London. The vehicle will be offered for silent auction. Proceeds from the sale of the vehicle will be donated to a good cause. The 81-year-old artist said: “To paint is in my heart and it’s in my blood. The way I paint was taught to me by my mother and my grandmother. The images and colours have changed and I have painted on many different surfaces and objects but I still love to paint. The patterns I have used on the BMW parts marry tradition to the essence of BMW. When BMW sent me the panels to paint, I could see the design in my head and I just wanted to get started! I start by painting the small ones first to get the feel of the surface and then it was easy as the design follows the lines of the panels. 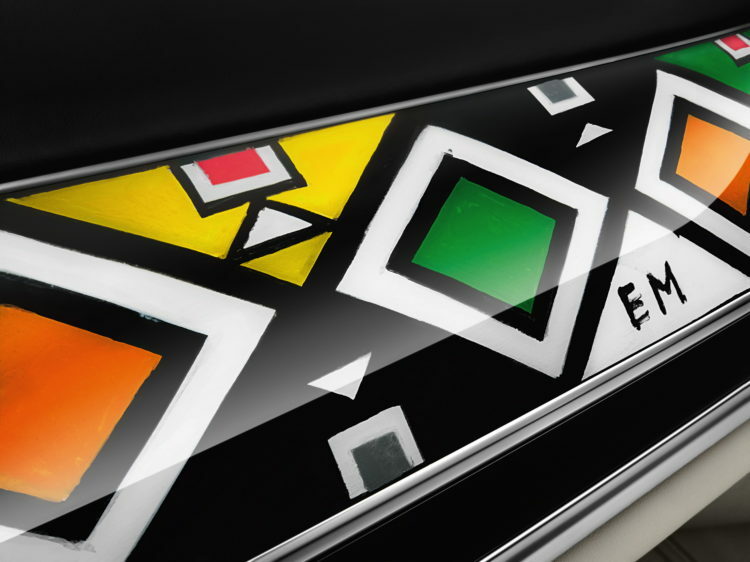 The BMW Individual 7 Series by Esther Mahlangu is a right-hand drive vehicle, boasting an array of equipment from the comprehensive BMW Individual Collection in addition to the unique features incorporated by the BMW Individual Manufaktur. 20-inch BMW Individual light alloy wheels in V-spoke styling 649 I underscore the elegant appearance of the BMW 7 Series while the exterior bodywork is coated in BMW Individual Pure metal Silver. The interior features BMW Individual full fine-grain Merino leather in Smoke White/Black, the highest quality leather available for a BMW, including seats with weave-look stitching and hand-woven piping. The leather’s natural smoothness and its fine structure offers a unique look and feel. The full leather trim also includes the rear panelling of the seats, the upper and lower instrument panel as well as the door panels, including B pillars finished in fine-grain Merino leather. A BMW Individual leather steering wheel with applications in Piano finish Black and an Alcantara headliner in Smoke White complete the exclusive ambience of the interior. Love is a video game.